CaseComplete 2014 is now available. Check out what's new. If you’re not already applying agile principles to your projects, chances are you’re trying to figure out how. Just about every project team is interested in going agile, if they aren’t already. With CaseComplete 2014, you can bring agility to your requirements in the form of user stories. A user story is a short, simple description of a feature, often written from the user’s perspective. They are shorter and less formal than use cases and, more importantly, regarded as an agreement to have a conversation. It’s in those follow-up conversations where the details and assumptions are hammered out. CaseComplete lets you to stay agile by starting with user stories. When it comes time to fill in the details behind those stories, you’ll have a place to put everything: requirements, diagrams, use cases, test scenarios and more. As you’d expect, you can pull it all together to produce whatever forms of documentation are right for your team. The ability to add test scenarios alongside your use cases and requirements is a feature many of you already use. If you’re creating test scenarios, you’ll likely also want to manage test runs and report on the results. Many of you already use a different tool for that, and for some of you, that tool is Microsoft Test Manager (which is part of Visual Studio Team Foundation Server). 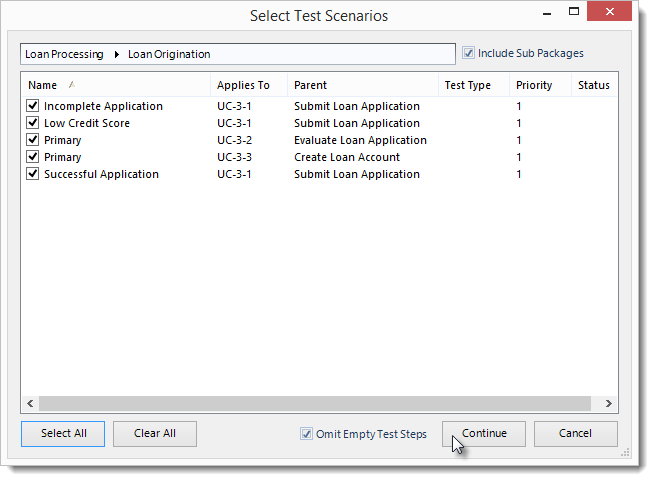 CaseComplete can now upload test scenarios directly into TFS. You’ll get all the benefits out of having test cases in TFS without spending the effort to create them. Just choose which scenarios you want to upload and CaseComplete will create them for you. There are a bunch of other features worth checking out, too, including completely updated Excel reports, a redesigned start page, and an API for Requirements.cc.